After each game of the 2018-2019 season, the forward player of the Algonquin Thunder women’s basketball team, Hadeza Ismaila, goes home to her family and boyfriend to make every moment count in her life. Ismaila, an 18-year-old girl who was born and raised in Ottawa, is currently taking pre-health sciences at the college and was a star player of the women’s basketball team, only training for four-and-a-half years. At first Ismaila was not a basketball player. She previously played soccer up until grade nine orientation day at Cairaine Wilson Secondary School, where the coach at the time called her out. The coach, Kerra Wadley, saw something in her and wanted her to try out for the sports team. Her biggest inspiration, Wadley guided Ismaila through her basketball career for about three or four years and became someone with whom she built a close connection. Ismaila stated that they would meet at lunch and she would gain advice on basketball and her personal life that helped to push her to go forward. Due to being a basketball player herself, Wadley would give her tips on how to improve and find ways to work around her struggles. “I always pushed myself because I wanted to make her proud. I wanted it for myself, but I also wanted to do whatever I did for her,” Ismaila said to the Times. Ismaila stated that she had bad coordination and was not the greatest at basketball at the beginning of her career, but with the help of her coach, she developed skills within her high school years. Overall, the team won three championships in a row within three years. In the 10th grade, she decided to be more serious about the sport and started playing competitively outside of the school season for about two years for the Gloucester Wolverines basketball team. In the 11th grade, she started off on the school’s team during their season and then on the Wolverines which she was able to focus on after the school’s basketball season. During those years, it was difficult for her school friends who weren’t full-time athletes to understand the hardship of balancing school, work, the team and her personal life. However, she had her teammates to relate to and built a relationship with them as they shared the same struggles. Her biggest downfall was when she tore her anterior cruciate ligament (ACL), causing her to fall back a year on training. She had waited a long time to get surgery and went through six months of rehabilitation therapy. After recovering, she was able to join once again during her senior year of high school and moved up to the Wolverines elite team, a new branch off of the previous team she played for, to play in a higher level in competitive basketball. The year was a milestone for her due to playing in three all-star games and winning bronze in provincials in division one. “That opened a lot of opportunities for me and I think that’s where I started to really spark because I feel myself being off for a year, I really needed to push myself to get to where everybody else is and even better,” said Ismaila. Coming to Algonquin, she gained more experience and fought through challenges she hadn’t faced yet. Due to losing the first game at the OCAA Championship Tournament by 10 points this season, the team didn’t feel they played their best. However, the way she and her teammates played reflected on how strong of a player she was. As a result, she won two awards for the Women’s Basketball East Division All-Rookie Team and the Women’s Basketball East Division Second Team All-Stars. Ismaila grew up in downtown Ottawa up until the fourth grade when she and her family moved to Orléans. Moving to the suburbs of the city gave her more opportunities to join sports as she said that downtown felt too busy to be involved. She currently lives with her mother, Maria Esperon, who is Filipino; and her father, Ismaila Musa, who is half Nigerian and half Ghanaian. She also has younger siblings who are 15, nine and five years old. Ismaila felt blessed to grow up in with a close relationship with her family, as she states that “family is everything”. “I kind of opened that basketball door for my family,” said Ismaila. Being the first in her family to join a sport competitively, her family became the biggest supporters of her basketball career. Her parents would be her sideline coaches at every game, telling her what to do. Even when knowing how to win the games, her parents wanted her to hear it from another perspective. Nadia Ismaila, her younger sister, decided joined basketball during the seventh grade. Her older sister has been a person she has developed a strong connection to and followed her footsteps as a person and basketball player. “She’s a really good role model and she’s a really good person to look up to because she’s a really hard worker,” said Nadia. As well, her boyfriend, Sean Bartlett, has been a part of her life for quite a while. The couple met in the ninth grade and have been dating for a year and a half. To him, she is “energetic, caring, a very bright person; someone who stands out and (is) hardworking” as he has been by her side throughout her school, basketball and family life. For future plans, Ismaila hopes to get into uOttawa for human kinetics in the upcoming fall term, but may take a year off of basketball to focus on balancing school, work and her personal life. She would like to pursue a career as a sports therapist as she says that it had a big impact on her life, especially when she tore her ACL. Her family constantly cheers her on, hoping for her to be successful and continue playing basketball. 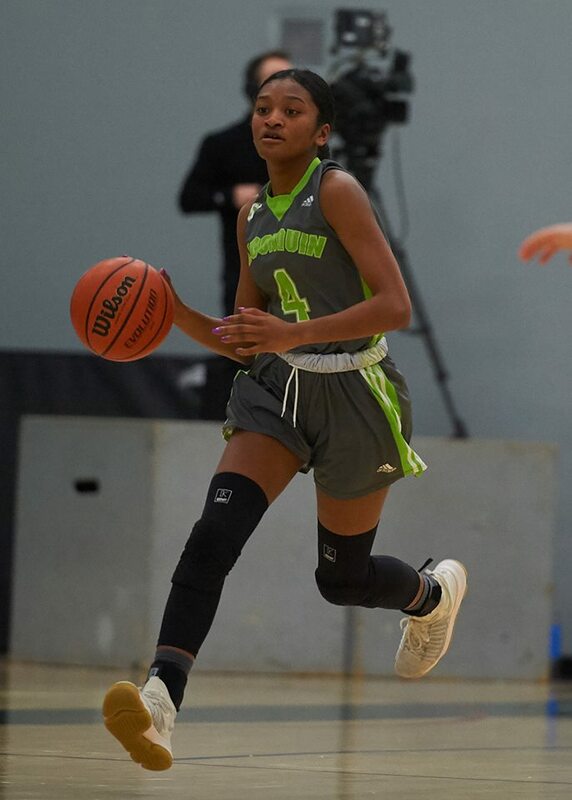 Young basketball star continues to shine on the court and beyond Reviewed by Jessica Alberga on April 4, 2019 .